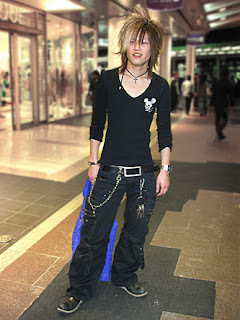 In the United States and Europe, it would be quite ordinary to see Vin Diesel-type 'skinheads' walking down the street. 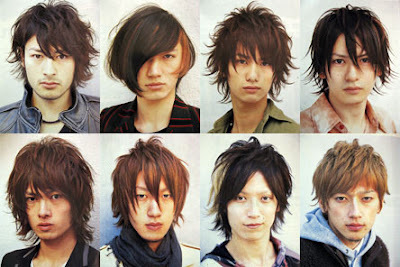 In Japan, however, it would be very rare – a lot of the guys there have long, anime-style hair! Check out the young Japanese guy with blue hair (above right) who we saw just outside of Osaka Castle Park. 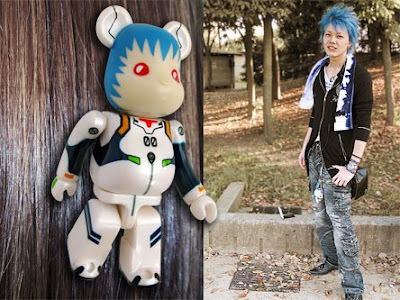 He actually reminded me of my Series 13 Evangelion 'SF' Bearbrick (above left), which was based on the character of Rei Ayanami, the first pilot in the anime and manga series. My companion J, fascinated with the hip Japanese hairstyles, paid a huge sum for a cut at a Harajuku salon. While waiting for him, I leafed through a male hair catalogue and took some pics (below). Which do you like best? In downtown Kyoto, I took a pic of this guy (right) who has perfected the look from head to toe. When I told him I would post his pic on my blog, he immediately struck a pose!